MMMMM MOCHA! Finally got me some mocha! This was a great box full of coffee and mocha too! Plus a little candy. I love the variety here with the Bean Box! Mmmm love the smell of fresh coffee! Sent straight from Seattle, where some of the best coffee is. Luckily they partner with some of the best, top rated, award winning, small batch roasters. Nice and fresh, from the farm straight to your cup. The coffee is roasted to order so they ship within 2 days of roasting which is all good in my books! Love a dark blend? Prefer a lighter roast? They are easily customized. 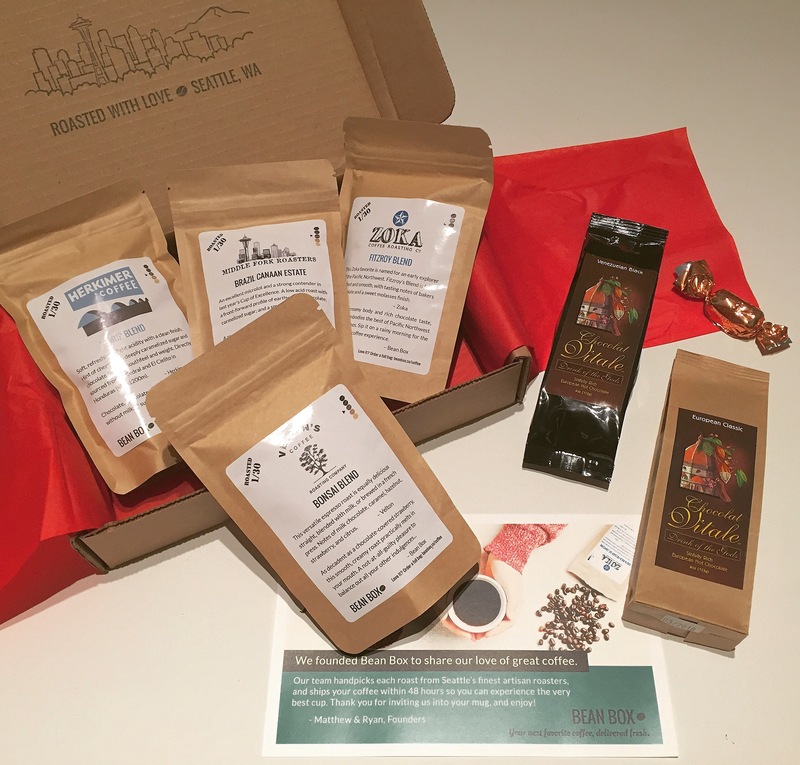 Each box will include 4 different roasts of 1.8oz, with tasting notes, profiles and brew tips and tricks of course. Velton’s Coffee – Bonsai Blend – Loving this espresso roast with hints of hazelnut. Herkimer Coffee – Drip Blend – Perfect for that every morning cup-of-joe. Zoka Coffee Roasters Co. – Fitzroy Blend – Nice and smooth, this one is a lovely chocolatey flavor. Middle Fork Roasters – Brazil Canaan Estate – This one has hints of cookie dough – YUUUUUM! Venezuelan Black Chocolat Vitale – Loving this one too, a little richer for that deep dark mocha.